Satipaṭṭhāna is the establishment or arousing of mindfulness, as part of the Buddhist practices leading to detachment and liberation. Traditionally, mindfulness is thought to be applied to four domains, "constantly watching sensory experience in order to prevent the arising of cravings which would power future experience into rebirths," namely mindfulness of the body, feelings/sensations, mind/consciousness, and dhammās. According to Polak, this is a misinterpretation of the oldest teachings, in which the four foundations refer to the six sense-bases, contemplation on the vedanās, which arise with the contact between the senses and their objects (vedanānupassanā), the altered states of mind to which this practice leads (cittānupassanā), and the development from the five hindrances to the seven factors of enlightenment (dhammānupassanā) as the result of this practice. 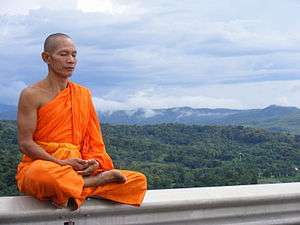 The modern Theravadan Buddhism and the Vipassana or Insight Meditation Movement promote satipatthana as key techniques for achieving mindfulness, promoting "mindfulness" as meaning careful attention instead of the recollection of the dhamma. Sati - Pali; Sanskrit smṛti. Smṛti originally meant "to remember," "to recollect," "to bear in mind," as in the Vedic tradition of remembering the sacred texts. The term sati also means "to remember." In the Satipațțhāna-sutta the term sati means to remember the wholesome dharmas, whereby the true nature of phenomena can be seen, such as the five faculties, the five powers, the seven awakening-factors, the Noble Eightfold Path, and the attainment of insight. Sati-upaṭṭhāna - "presence of mindfulness" or "establishment of mindfulness" or "arousing of mindfulness," underscoring the mental qualities co-existent with or antecedent to mindfulness. Sati-paṭṭhāna - "foundation of mindfulness," underscoring the object used to gain mindfulness. Anālayo argues from an etymological standpoint that, while "foundation [paṭṭhāna] of mindfulness" is supported by the Pāli commentary, the term paṭṭhāna (foundation) was otherwise unused in the Pāli nikayas and is only first used in the Abhidhamma. In contrast, the term upaṭṭhāna (presence or establishment) can in fact be found throughout the nikayas and is readily visible in the Sanskrit equivalents of the compound Pāli phrase satipaṭṭhāna (Skt., smṛtyupasthāna or smṛti-upasthāna). Thus Anālayo states that "presence of mindfulness" (as opposed to "foundation of mindfulness") is more likely to be etymologically correct. Like Anālayo, Bodhi assesses that "establishment [upaṭṭhāna] of mindfulness" is the preferred translation. However, Bodhi's analysis is more contextual than Anālayo's. According to Bodhi, while "establishment of mindfulness" is normally supported by the textual context, there are exceptions to this rule, such as with SN 47.42[note 2] where a translation of "foundation of mindfulness" is best supported. Soma uses both "foundations of mindfulness" and "arousing of mindfulness." "Dhammā" is often translated as "mental objects". According to Anālayo translating dhamma as "mental object" is problematic for multiple reasons. The three prior satipatthāna (body, sensations, mind) can become mental objects in themselves, and those objects, such as the hindrances, aggregates and sense bases, identified under the term dhamma are far from an exhaustive list of all possible mental objects. Anālayo translates dhammā as "mental factors and categories," "classificatory schemes," and "frameworks or points of reference to be applied during contemplation". Anālayo quotes Gyori as stating that contemplation of these dhammā "are specifically intended to invest the mind with a soteriological orientation." He further quotes Gombrich as writing that contemplating these dhammā teaches one "to see the world through Buddhist spectacles." In the Satipațțhāna-sutta the term sati means to remember the dharmas, whereby the true nature of phenomena can be seen. According to Paul Williams, referring to Erich Frauwallner, mindfulness provided the way to liberation, "constantly watching sensory experience in order to prevent the arising of cravings which would power future experience into rebirths. 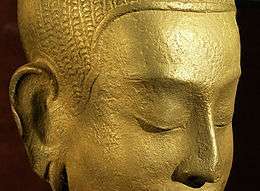 "[note 3] According to Vetter, dhyāna may have been the original core practice of the Buddha, which aided the maintenance of mindfulness. The four establishments of mindfulness are regarded as fundamental in modern Theravadan Buddhism and the Vipassana or Insight Meditation Movement. In this approach the emphasis is on mindfulness itself, as bare attention, instead of on the objects, mental states to be guarded, and the teachings to be remembered. The four establishments (Satipaṭṭhāna) meditation practices gradually develop the mental factors of samatha ("calm") and vipassana ("insight"). Thanissaro Bhikkhu notes that "satipatthana practice is often said to be separate from the practice of jhana," but argues that mindfulness is also an aid in the development of concentration. ↑ For the traditional use of the translation, "foundations [paṭṭhānā] of mindfulness," see, e.g., Gunaratana (2012) and U Silananda (2002). For appraisals supporting the parsing of the suffix as upaṭṭhāna, see, e.g., Anālayo (2006), pp. 29-30; and, Bodhi (2000), p. 1504.
that is, the four establishments of mindfulness. [subnote 2] The wholesome establishments of mindfulness are contrasted with the unwholesome qualities of the five strands of sensuality, namely pleasant sensations from the eye, the ear, the tongue and the body. 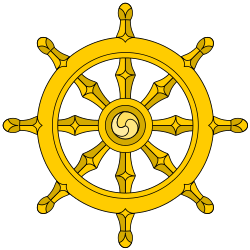 ↑ See the Satipatthana sutta (MN 10; DN 22); as well as SN 47.1, 47.18 and 47.43. These five discourses are the only canonical sources for the phrase, "ekāyano ... maggo" (with this specific declension). ↑ Bodhi (2000, SN 47 n. 123, Kindle Loc. 35147) notes: "Spk [the commentary to the Samyutta Nikaya] explains the 'method' (ñāya) as the Noble Eightfold Path...."
↑ SN 47.1 (Bodhi, 2000, p. 1627). Also see DN 22, MN 10, SN 47.18 and SN 47.43. 1 2 3 Williams 2000, p. 46. 1 2 Kuan 2008, p. i, 9, 81. ↑ SN 47.6 (Thanissaro, 1997) and SN 47.7 (Olendzki, 2005). ↑ Samyutta Nikaya, Ch. 47. See Bodhi (2000), pp. 1627ff. ↑ " Maha-satipatthana Sutta: The Great Frames of Reference" (DN 22), translated from the Pali by Thanissaro Bhikkhu. Access to Insight (Legacy Edition), 30 November 2013, http://www.accesstoinsight.org/tipitaka/dn/dn.22.0.than.html . Nanamoli, Bhikkhu and Bhikkhu Bodhi (trans.) (1995), The Middle Length Discourses of the Buddha: A Translation of the Majjhima Nikaya. Somerville: Wisdom Pubs ISBN 0-86171-072-X. Nhat Hanh, Thich (trans. Annabel Laity) (2005). Transformation and Healing : Sutra on the Four Establishments of Mindfulness . Berkeley, CA: Parallax Press. ISBN 0-938077-34-1. Nyanasatta Thera (2004). Satipatthana Sutta: The Foundations of Mindfulness (MN 10). Available at http://www.accesstoinsight.org/tipitaka/mn/mn.010.nysa.html. Olendzki, Andrew (2005). Makkata Sutta: The Foolish Monkey (SN 47.7). Available at http://www.accesstoinsight.org/tipitaka/sn/sn47/sn47.007.olen.html. Soma Thera (1941; 6th ed. 2003). The Way of Mindfulness. Kandy: BPS. ISBN 955-24-0256-5. Available at http://www.accesstoinsight.org/lib/authors/soma/wayof.html. Thanissaro Bhikkhu (1997). Sakunagghi Sutta (The Hawk) (SN 47.6). Available at http://www.accesstoinsight.org/tipitaka/sn/sn47/sn47.006.than.html. Thanissaro Bhikkhu (1997a). Sedaka Sutta: At Sedaka (The Acrobat) (SN 47.19). Available at http://www.accesstoinsight.org/tipitaka/sn/sn47/sn47.019.than.html. Thanissaro Bhikkhu (1997b). Sedaka Sutta: At Sedaka (The Beauty Queen) (SN 47.20). Available at http://www.accesstoinsight.org/tipitaka/sn/sn47/sn47.020.than.html. Thanissaro Bhikkhu (2008). Satipatthana Sutta: Frames of Reference (MN 10). Available at http://www.accesstoinsight.org/tipitaka/mn/mn.010.than.html. Saddhamma Foundation Information about practicing Satipatthana meditation.